T-Mobile’s LTE network is still on the slow path to success, but thanks to TmoNews reader @milanmilanovic, we’re getting a first look at LTE in New York City. It’s definitely still in the planning stages and while it’s not nearly ready for public use, we’re just happy to know there’s progress. In order to get on to the network, Milanovic stated that he forced his way on to the network and manually searched with his Nexus 4 on its lone LTE band. According to Milanovic’s comments to GigaOM, he discovered a 5 MHz-by-5 MHz link in the 1700/2100 range but he could only meet half of the 37Mbs bandwidth the network can theoretically support. More importantly, Milanovic only had a few minutes at a time to try the network before T-Mobile got wise and booted him off. With LTE “ready” to fire up in Kansas City and Las Vegas any day now, we’re betting that a big market like New York City will make a perfect proving ground for the young LTE network. Even as T-Mobile works to rollout LTE, they are simultaneously continuing their 1900MHz expansion and released an updated list of the 49 cities now ready to support HSPA+ service on that band. 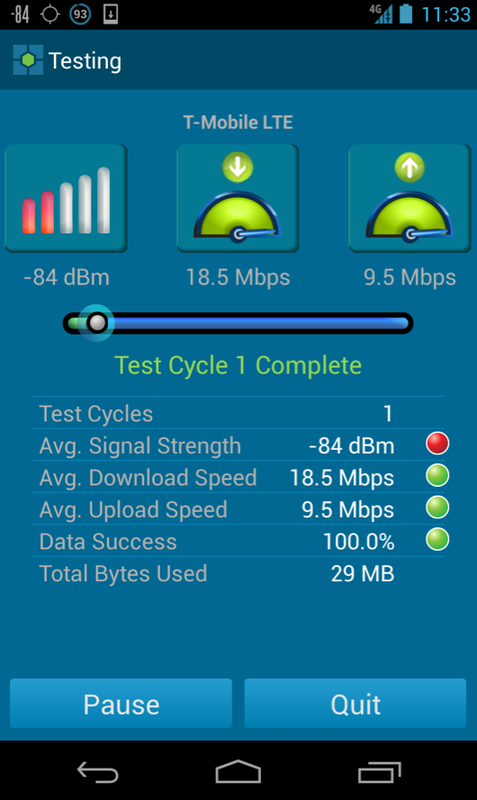 As a friendly reminder, T-Mobile’s initial rollout of HSPA+ on the 1900MHz band is capped at 21Mbps. The current rollout of 49 cities covers 142 million people as T-Mobile stated during last quarters financial earnings. I got LTE on my ATIV S the other day :] I was unable to access data but it was nice seeing that LTE logo on my screen. I might just get on the N train and head to Astoria to test it. Expect a lot of Edge here. Cool let me know how it works. I live in Astoria but I won’t be able to tell. Reading the original report over on Howardforums, looks like there’s LTE live over by Atlantic Terminal in Brooklyn too, can’t wait to test it out as soon as I get the HTC One. Sprint, of all carriers, just released LTE in my area. Sadly, T-Mobile is still starving us with EDGE. Never say never. Times are changing and the need for this high speed tech is ever so increasing. Good to hear that New York won’t have to wait too long for LTE! Can’t wait for my Note 2 to use it! I hope T-Mobile rolls out faster LTE than that. 10×10 MHz or even up to 20×20 MHz would be awesome! I’m pretty sure they will, their LTE is not intended for public use, and if it was this slow, they would be the laughing stock of the mobile industry. HSPA+ 42 is faster than this download wise. thats what i was thinking…well download wise. The upload was pretty impressive. A network scan in LTE only mode shows t-mobile LTE lit up in southern California too. Is anyone in new york getting LTE on their iphone 5? No. As I have just looked in my cellular settings, I still don’t have the option to turn LTE on. I am wondering if when LTE is actually live, will that option suddenly show up. I have an LTE switch for mine, even though I’m running on AT&T’s network via Straight Talk. My area does NOT have AT&T’s LTE yet. Is your iPhone factory unlocked or an unlocked one that was locked for AT&T? I am on T-Mobile and I have a factory unlocked iPhone 5 that I bought directly from apple model number 1428 and there isn’t an LTE toggle switch available. is at&t’s LTE even on the same band? T-Mobile needs to work on the central area of the US because I don’t think I’ll ever see 3G on my iPhone 5. T-Mobile only upgrades the same areas over and over. If you still have 2G only now you won’t be getting LTE or 3G anytime soon. Even then their network is full of holes even in areas with 4G or 4GLTE and forget about service inside most buildings. Ever go into a NYC building and get a signal anywhere past the lobby area? They don’t get a shoddy network reputation for nothing. You need to pay attention to their updated coverage maps instead of spouting nonsense. Their updated coverage maps, like the maps before them are false. Please, show me this coverage expansion. The only areas they’re expanding are where AT&T roaming exists, and even then, it’s a real half-assed attempt. My favorite is when they add a single new cell site to a town and leave all the other ones around it on EDGE. It’s like they want to have a swiss-cheese network. There’s a big difference between real coverage expansion and simply “covering up” roaming areas. People aren’t choosing a carrier based on the types of phones they have anymore, it’s about the network. And T-Mobile simply doesn’t have it. I just about always got service with my one s inside buildings in nyc. very rare for me not too. It was always 4g. My samsung? Forget it.. They haven’t expanded to the middle of the country because the parent company wasn’t spending the money to get coverage out to those places on 4G. All that will change in two years. As far as T-Mobile working in NYC buildings, I live there, and I don’t know if you do but 9 times out of 10 I get full or strong signal in 4G when I walk into many NYC structures. Now that I am on an iPhone 5 myself, i will back you up and say that often the 3G signals will not penetrate and you will get EDGE. However I notice improvement where I revisit those spots and I am getting 3G signals albeit weak. In the end, this may not matter later on because LTE will be here and 1900mhz HSPA+21 will be far better than it is now. They never finish what they start. A couple of years from now some new technology will be out and T-Horrible will stop building LTE and begin installing the new tech in the same cities where they first began with LTE. Meanwhile, the rest of the country, which is 90% of their network, will be stuck on 1990’s Edge. In central US (at least Central Illinois) T-Mobile shares spectrum with AT&T so if you’re really looking for 3G or 4G now then you maybe able to use AT&T’s network (Even tho its as slow as Edge). AT&T’s HSPA+ network isn’t as fast as T-Mobile’s (in most cases), but I’m not complaining about 5-9Mbps in many places I’ve done speed tests. I frequently see speeds just over 1Mbps in many areas as well. To say AT&T’s HSPA+ is as slow as EDGE, you really don’t know what you’re talking about. I live in the city of Downey, its like 15 minutes away from Los Angeles will i still get LTE or only the main city of LA? Or will all other cities in Los Angeles will get LTE? It is not know yet. You will have to wait until its official. MetroPCS has a fair amount of spectrum in around LA. So if metro works in your area, it’s likely you see the upgrade. Just a lot later because that can’t move on it till approvals for buyout is complete. And Oh,… its been a while since I’ve commented … how’s everyone doing…? That’s exactly my point, I’m hoping that when the refarming, for the most part, in complete, we will be able to purchase any unbranded phone from anywhere in the world and hold hands with our EU/AS/AU brothers and sisters and yell out ” Free at last… Free at last.. Thank God Almighty…We Are Free At Last”. Very exciting news. Can’t wait to read what Richard Yarrell has to say about this! It’s great to know New York City will be up and running LTE soon. As a big market city i can see Tmo getting it done in the New York market soon. Many Galaxy S3, Galaxy Note 2, and Nexus 4 owners will be happy. team Richard Yarrell!! – D don’t mind your haters none sir. I can’t worry to much about that on a daily basis. People will be people I have very thick skin us South Bronx guys don’t worry too much about anything. I want 4G LTE on my LG Google Nexus 4. I don’t want to root my phone. I hope Google fixes this. I’m not accepting or installing the 4.2.2 update on my Nexus 4 at all, I’m keeping it stock and just not updating. Looks like I will be waiting for the Galaxy Note 3 in September/October. The Galaxy Note 2 is still the GOLD STANDARD of the industry. It’s the devices everyone is trying to catch up too and seem to be copying for that matter. All of the software features that the Galaxy S4 will make it’s way to the Note 2 in the 4.2.2 update and it will be fine. Waiting another 6 months will be extremely easy. You just made my day, Richard. Congrats my brother. I’m in Miami and I’m licking my chops for my Note2 to get some LTE love but in the meantime,I’m seriously enjoying the HSPA+42 on TMobile and going to get even better w/Metro PCS merger! Yes T-mobile is definitely doing some special things. Having that fall back to HSPA+ 42 will a great thing for so many handsets. It’s good to see t-mobile change right before our eyes. That merger will be very big for all of us. You better believe it.I will be watching 4/12/13 for the vote and be waiting for some 4.2.2 love for my Note 2.My nephew is getting my GSIII I mailed off yesterday and he will receive it Monday.And the GSIII will get some GS4 love too. As you say,the Galaxy Note 2 is the GOLD standard of smartphones even Apple knows this and that’s why they put that stupid ad out . Not everyone likes holding a tablet to their head. Your gold standard isn’t everyone’s. If your at South Padre Island or Port Isabel Texas. There is 1900mhz HSPA+ there. I’m using a nexus 4 on t—mobile monthly 4G I know the nexus 4 has a LTE chip inside will I be able to use it once they roll out LTE???? Nexus 4 has been selling with Band 4 LTE enabled since since day one, and up until the latest 4.2.2 update it’s been on. Latest OS update disables it. If you chose not to update your software, you’ll be able to connect to T-Mobile’s LTE, and there is nothing unlawful about it. If anyone should get in trouble, it’s LG/Google for not reporting Nexus 4 LTE capability to FCC for testing. It would be great if they would get Louisville taken care of being that it’s the 29th largest city in the country. I’m really hoping they are working on the 1900mhz switch is why speeds here have become flaky. It is flaky because they are working on LTE. I’m ready for iPhone to roll out, forget Samsung it’s all about Apple in the next few weeks. NEVER LOOK BACK!!! I’m in Groves not far from you and T-Mobile has been working on a lot of towers in the area as well. This doesn’t look that different from when Verizon’s LTE network first opened up. I remember when people were excited to get 18 down and 9 up. T-Mobile refarmed like 1/4 of Birmingham, AL back in December 2011, and since then there has been zero improvement! Idk why they just don’t finish the city since its been well over a year that they started!! I have 4G LTE here sometimes at San Jose. Hmmm, I’m kind of tired of dropping to EDGE on my HTC One X in the DC area. t Mobile sales the one x? No. I mentioned it because it is a phone that should have benefitted from the refarming mentioned in this article. So when will the software be released so we can use LTE? They have to deploy the network sites first. You won’t have LTE if the towers aren’t supporting it yet. That’s too bad. =/ I live in the Bay Area and on my location I have strong signal, well that’s what T-Mobile’s coverage map says. The building penetration is horrible here. I have to walk down the street and outside of my apartment complex just to get 13-17mbps depending on my phone as well. Inside my apartment, I don’t even get 1mbps and I’m forced to use my horrible wi-fi connection just to browse and stream Netflix. But I pulled off using 30GB of data this month lol. I used my HTC One X. Must be something to do with AT&T phones. My ping isn’t bad on my HTC One X. I get around 40-70 ping but sometimes 500. When I switch my sim back to my T-Mobile phones, the ping is horrible. I hope all goes well for you in L.A. Just can’t wait for 4G LTE to come out. And hopefully T-Mobile fixes there building penetration problem and expanding more of their HSPA+ towers. I get 30mbps download on my T-Mobile Samsung Galaxy Note II. You are comparing apples and oranges. Jay337 is talking about PCS coverage and you are talking about AWS coverage. T-mobile does not publish any PCS coverage maps. PCS coverage = 1900mhz = primarily the 2G footprint. You can look at that on the coverage map. If you mean where do they have 3G on PCS as far as the coverage map goes, yes that’s correct, not yet published. My LG Google Nexus 4 was lagging at the time. I must had replied to the wrong person. I feel u about data not working in the downtown area. I need more consistensy at home on the northside. AWS was ALWAYS full bars in my house on my nexus one. iPhone i get 3 max and then a drop to EDGE after a while. They should penetrate the building similarly. does the LTE still boot people off or is it working? 37 Mbps? I thought they’re rolling out LTE-Advanced on day 1! LTE-Advanced is not some magic switch that turns your phone into 1Gbps capable battery powered modem… It’s a set of tools and T-Mobile’s Release 10 network is capable of implementing them as they become available. Right now there are no commercially available LTE-Advanced smartphones and modems in general, so it makes absolutely no sense to roll out the updates at the base stations at this time. Ultimately, LTE download speeds are heavily affected with the amount of spectrum deployed, and it looks like T-Mobile isn’t willing to scale down their HSPA+42 networks and free up some AWS for LTE. Their HSPA+42 is fairly inefficiently using up 20Mhz of that valuable AWS spectrum that they could be using for LTE and provide more capacity (73Mhz for 2x10Mhz), but I guess HSPA+42 user base is large enough for T-Mobile to scale it down. Imho HSPA+21 (and 2x10Mhz LTE) in AWS augmented with HSPA+21 in PCS could’ve been a much more efficient solution. It looks like they’re starting small with mostly 2x5Mhz configurations, hoping that MetroPCS merger gets approved ASAP so they can widen that LTE to 2x10Mhz this year. Don’t forget that they’ve promised 2x10Mhz in 2013 for 90% of Top 25 Markets. Where does it say 21mbps? Are you looking at your speedtests or ServiceMode, or something else? How do you know the cell sites around you are only HSPA+21. Are you on an iPhone maybe? Yeah, how do you know if the tower is supported by 21mbps or 42mbps? I don’t see it anywhere. I use speedtest. What app do you use? I still have tons of area covered in my city with 42mbps towers. None of my phones are capped at 21mbps. I get over 24+Mbps and up to 30 is my max. That list makes me sad. No Kentucky. No Tennessee. No Alabama. No Arkansas. No Mississippi. Look, even though I live here, I’m not a huge fan of the South either, TMO. But could you throw us a bone? When airportal.de works, you can see the huge, gaping hole in the middle of the U.S. with no sightings of the 1900 frequency. Let’s do something about that soom. Mmkay….thanks. T-Mobile should have built their HSPA network out before taking on another project. It’s plenty fast enough. In the one small 4G area I have I get 18 mps down with HSPA 4G. Verizon’s LTE in the same city only clocks at 15 mps. This refarm project is the lamest idea I’ve ever heard of. They should spend the money they’re wasting on that to complete the HSPA build out and get 90% of their customers off Edge. LTE have many benefits , not only for cell phone but way more , u can use better modems that can provide business user a better and fast VPN ‘s , saving cost as providers to pay high price of bandwidth due to lower pipe lines, can be use video transmitting such as iptv …and so many future benefits also due to high speed the website may will be more heaver then these days , may be use for TV news broadcasters with out having big Dish installed trucks etc….thats what i think..
I’m not against LTE, I’m just saying T-Mobile needs to finish what they start. Surely you agree the 4G HSPA network is far better than their Swiss Cheese Edge network? The refarming for 1900MHz is to better support a wider array of unlocked phones and the iPhone. Since T-Mobile announced they have over 2 million active iPhones, and adding about 100,000 per month, they want to push the update as much as possible. I, for one, have an unlocked iPhone 5, and really want to make the switch, but T-Mobile doesn’t even have 3G/4G (period) in my area. Once they upgrade, I’ll have HSPA+ “4G” here. When T-Mobile starts selling the iPhone this year, it will need to run on the refarmed 1900MHz network for anything better than EDGE (2G). To say the refarming is the lamest idea you’ve ever heard of is rather lame in itself. You may not personally like the iPhone, but there are hundreds of millions of people who do, and T-Mobile wants a bigger piece of that pie. I can’t blame them. LTE big benefit , bigger pipeline , less lose of data and signal ,and saving money on bandwidth loss due to lover pipe line , i believe one they will done LTE assembling all over they will increase the bandwidth ,because they want to keep more bandwidth on HSPA+ where they have 90% phones are connected . if T-Mobile convert voice over LTE this will be super amazing . I live in the biggest city between Pittsburgh and Harrisburg, and we’re still stuck with EDGE (2G), period. A college town about 40 miles north (PSU State College) has it, but not refarmed for 1900MHz yet. I’m waiting for them to upgrade my area so I can make the switch. still no Saint Louis or Colombia Missouri… I’d really like to see those with the 1900 spectrum soon, but really we all want our on neck of the woods to be covered. So when they say Los Angeles, CA, is that just the specific city or the Greater Los Angeles area? In Pasadena and La CaÃ±ada, I still get EDGE. whether it did or not, T-Mobile’s Metro-Detroit coverage already has a ton of of spectrum for AWS here, 50Mhz. Metro-PCS will only add to that wealth of spectrum. T-Mobile has 40Mhz of AWS in Detroit area. A+B AWS Licenses. Also has 30Mhz of PCS. MetroPCS brings in 10Mhz of AWS and 10Mhz of PCS. I have an unlocked (unlocked by AT&T) Inspire 4g. I pop in my T-mobile SIM card and I get Edge and then after a few minutes it goes to H+ or HSPA+. I test the speed and I get upwards of 9 megs down and 2 megs up. Not too shabby. After a while, sometimes 15 minutes, sometimes 2 hours it drops GPRS and then up to Edge. It stays with Edge until I reboot the phone. What is up with that? I am in Austin, TX. Do I need a software upgrade? Is there a setting I can change? I have a Samsung Galaxy Nexus as my primary device, but I like to tinker with other stuff. Any ideas? You might try resetting the network settings. I gotta say…it was really refreshing to be sitting around in downtown Wenham with full 3G on my iPhone while the rest of my family with Sprint/Verizon/AT&T had barely 1 or 2 bars. The look on my Aunt’s face when I told her I pay $70 a month for unlimited everything (minus tethering) was priceless! Thanks for the news, David. I was on my lunch break at DISH earlier today when I read another article that said T-Mobile LTE has already been detected here in Denver. My Note II is updated, ready for LTE, and I can’t wait for T-Mobile to flip the switch so I can get the most out of my DISH Anywhere app. It streams all of my live TV channels and recordings from my DVR to my phone; I love it because I can watch live baseball games, even when I’m not at home, and with T-Mobiles higher data speeds, I can stream in higher definition!